It appears common for Supercells to track between Dhaka and Fairdpur, along the Padma river. Agartala radar covers all of Bangladesh and is generally reliable beaming back radar images. 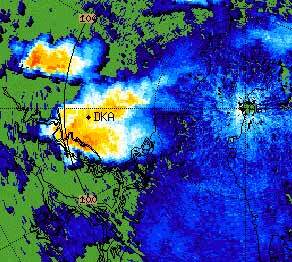 Kolkata radar also covers most of the primary region, except the extreme eastern and northern portions. This area is also of interest because this far eastern area is typically near the Dry line with extreme instability built up and is an area where additional research needs to be done.